Product #1222 | SKU C26-1241 | 0.0 (no ratings yet) Thanks for your rating! 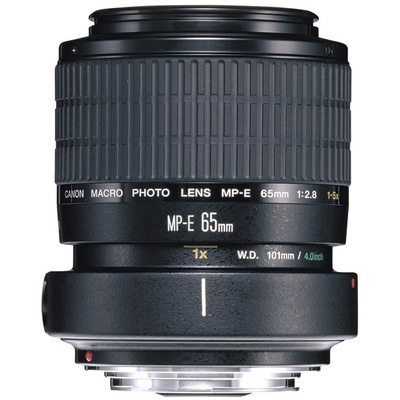 A unique lens exclusively for use in the macro realm. The Canon MP-E65 f2.8 Macro Photo Manual Focus Lens is a unique lens exclusively for use in the macro realm, it can fill a 35mm frame with an object as miniscule as a grain of rice! Floating internal lens elements keep the resolution sharp throughout the range of focus. The lens also has an element of ultra-low dispersion glass. For macro shooters with a desire to document the diminuitive, the MP-E is a quantum in ease-of-use compared to previous solutions involving bellows.